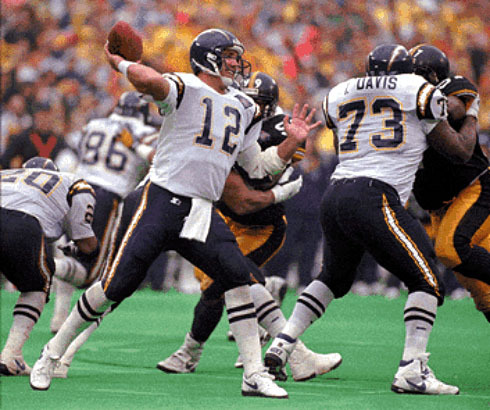 The Pittsburgh Steelers were heavily favored to win the AFC Championship game on January 15, 1995 as they hosted the San Diego Chargers at Three Rivers Stadium. In their third year under Head Coach Bill Cowher, the Steelers had won the AFC Central with a conference-best 12-4 record. The offense was the league’s best at running the ball and had an outstanding tandem of running backs in Barry Foster and Bam Morris as well as FB John L. Williams who, tellingly, was the club’s leading pass receiver. Sixth-year QB Neil O’Donnell was a good fit in the conservative offense – not flashy, but also not prone to making mistakes. 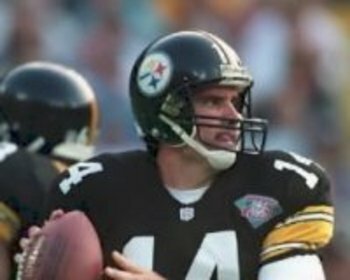 It was the “Blitzburgh” defense that carried the club, however, with an outstanding linebacker corps that included All-Pros Kevin Greene and Greg Lloyd as well as run-stuffing Levon Kirkland and versatile Chad Brown. Another All-Pro performer, CB Rod Woodson, was the key player in the backfield and CB Carnell Lake earned selection to the Pro Bowl. The Chargers finished first in the AFC West at 11-5, but had slowed after getting off to a 6-0 start. Head Coach Bobby Ross was also in his third year and, unusual in the franchise’s history, favored a power running offense. In his second season, RB Natrone Means ran for 1350 yards and 12 touchdowns. At quarterback was Stan Humphries (pictured below), who GM Bobby Beathard had drafted in Washington and then traded for with the Chargers. Like the Steelers, the pass receiving group was unheralded but effective. The defense had a fine pass-rushing line, led by Pro Bowl DE Leslie O’Neal (12.5 sacks), and a great middle linebacker in Junior Seau, who still played at a high level despite being hampered by a pinched nerve all year. There were 61,545 fans in attendance on a 60-degree day in Pittsburgh that was overcast with occasional rain. The Steelers took the opening kickoff and put together a solid 13-play, 67-yard scoring drive. In a third-and-twenty situation at midfield, O’Donnell passed to WR Andre Hastings for 18 yards and, going for it on fourth-and-two, threw again to Hastings for another 11 yards. John L. Williams capped the series by catching a pass from O’Donnell for a 16-yard touchdown and the Steelers had the early 7-0 lead. That was the score at the end of the first quarter as the teams traded punts. The Chargers got a break late in the period when Foster fumbled and safety Darren Carrington recovered at the San Diego 41, but they were unable to capitalize and had to punt for the third straight time. The Steelers took over at their 12 yard line and began to move the ball effectively as O’Donnell completed passes to TE Jonathan Hayes for 16 yards and WR Yancey Thigpen for 21. Pittsburgh converted another fourth down on an O’Donnell quarterback sneak that just got the needed yard to the San Diego 38. The Steelers made it to the Chargers’ 27 before being backed up by a holding penalty and ended up having to punt. San Diego’s offense had been quiet thus far, but taking over at their 20, Means immediately ran for 17 yards and followed up with a 15-yard gain on a pass from Humphries. 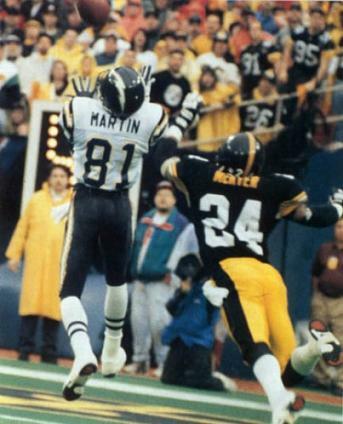 A long pass intended for WR Shawn Jefferson drew a pass interference penalty that put the ball on the Pittsburgh two. Three straight runs by Means were stopped, however, and the Chargers were forced to settle for a 20-yard field goal by John Carney. The Steelers came back with a 12-play drive that covered 51 yards with O’Donnell converting three third downs along the way with pass completions, all to WR Ernie Mills. With 13 seconds remaining in the half, Gary Anderson booted a 39-yard field goal and Pittsburgh went into halftime with a 10-3 lead. Thus far, the Steelers had outgained San Diego by 229 yards to 46 and had 13 first downs to the Chargers’ four. Despite the closeness of the score, Pittsburgh was clearly dominating the contest. It looked even better for the Steelers when Rod Woodson intercepted a Humphries pass on the third play of the second half. O’Donnell connected with TE Eric Green for 33 yards to highlight a 50-yard drive that ended at the San Diego six yard line. Anderson kicked a 23-yard field goal to stretch Pittsburgh’s lead to 13-3. The Chargers needed a big play on offense and they got it on their next series. On the fifth play, Humphries threw to a wide-open TE Alfred Pupunu for a 43-yard touchdown and, with Carney’s extra point, it was suddenly a three-point game midway through the third quarter. The teams traded punts for the remainder of the period and into the fourth quarter. With just under ten minutes to go, the Chargers took over at their 20. Humphries tossed back-to-back completions to Pupunu that covered 31 yards and runs by Means got the ball into Pittsburgh territory. On a third-and-14 play, Humphries went long for WR Tony Martin, who outmaneuvered CB Tim McKyer for a stunning 43-yard touchdown (pictured at top). Carney’s extra point put San Diego ahead by four points. Now with 5:13 on the clock, the Steelers moved furiously down the field. O’Donnell completed seven consecutive passes, the longest of 21 yards to Green to the San Diego nine for first-and-goal at the two-minute warning. Foster was stopped for a one-yard loss and O’Donnell’s pass intended for Green was incomplete. A throw to Williams gained seven yards, but it was now fourth-and-three. O’Donnell threw toward Foster in the end zone, but LB Dennis Gibson knocked the pass away and that was it. The Chargers were able to run out the clock and advance to their first Super Bowl appearance with a 17-13 upset. The Steelers won the statistical battle, outgaining San Diego by 415 yards to 226 and accumulating 22 first downs to 13 for the Chargers. Neither team was able to effectively run on the other, with identical rushing totals of 66 yards (on 26 carries by the Steelers, 24 by San Diego). There was only one sack – by the Steelers – and each team turned the ball over one time. Pittsburgh was far more penalized, however, getting flagged 8 times at a cost of 111 yards to three for 15 yards on the Chargers. Stan Humphries completed 11 of 22 passes for 165 yards with two touchdowns and one interception. Alfred Pupunu (pictured above) led San Diego’s receivers with 4 catches for 76 yards and a TD. The wide receivers combined for just three catches, but Tony Martin’s for the game-winning 43-yard score was a very big one. Natrone Means rushed for 69 yards on 20 carries (Humphries had -3 yards, accounting for the lower net team total). Defensively, Junior Seau had 16 tackles and spearheaded the effort that shut down Pittsburgh’s running game, even after suffering a shoulder injury on a tackle late in the first half. For the Steelers, Neil O’Donnell (pictured below) went to the air 54 times and completed 32 for 349 yards with the one TD and none intercepted - it was the failure to complete a pass in the end zone in the climactic possession that was most remembered afterward, however. Ernie Mills had 8 receptions for 106 yards and John L. Williams contributed 7 catches for 45 yards and a TD to go along with his three rushing attempts for 16 yards. Eric Green gained 80 yards on his 4 receptions. 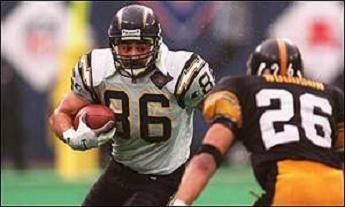 Barry Foster, thanks to the inspired play of Seau and the San Diego defense, was held to 47 yards on 20 attempts. The Chargers faced another uphill battle in the Super Bowl against the NFC Champions, the San Francisco 49ers. This time they came out on the short end by a decisive score of 49-26. They returned to the postseason in 1995 as a 9-7 wild card entry, lost in the first round, and didn’t reappear in the playoffs until 2004. The defeat was a bitter one for the Steelers and their fans (a clearly distraught Tim McKyer had to be helped off the field afterward), but they came back to win the AFC title in 1995, losing to the Cowboys in the Super Bowl. They would remain regular contenders through the remainder of Cowher’s coaching tenure and beyond.